I have been wanting to bake for weeks. I'm usually a cake and bread kinda girl but every once in awhile you just need some cookies in the house. I will admit... I kind of hate making cookies. They're specific and I can't get too fancy or freehand with things like I enjoy doing when I'm cooking. I have a very personal vendetta against rolled sugar cookies. A special loathing, like The Grinch, but drop cookies? Drop cookies I can handle. 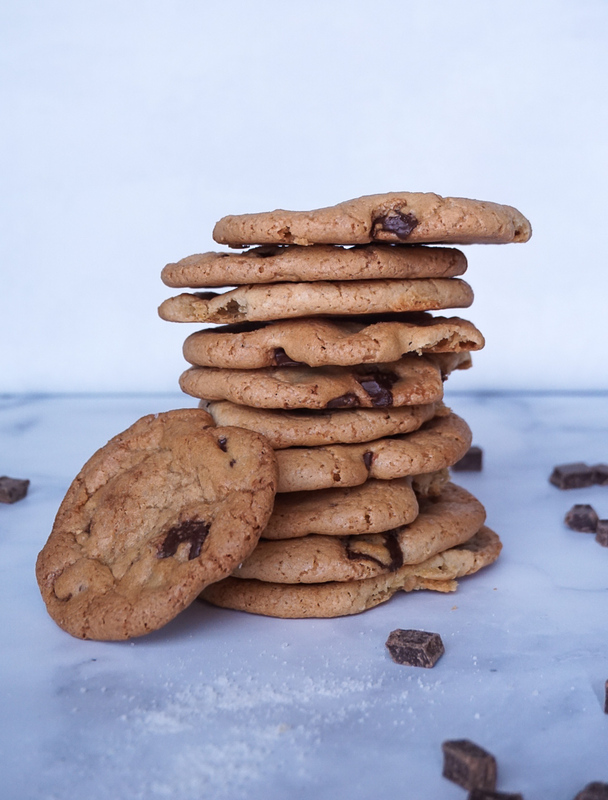 The dark chocolate chips play so nicely with the sea salt in this recipe. I used a sea salt I picked up when I was in Greece because I could not find my Pyramid salt but these cookies would really love a big flaky salt, so if you have it, use it! If you don't have anything fancy or flaky, use Kosher salt but be careful not to over do it because it may read as "salty" rather than an additional flavor boost. I ate a few directly out of the oven which was heavenly. While warm if you feel the cookies don't have as much salt as you'd like, sprinkle a few more flakes on now so that they stick. In a 375 degree oven, preheat cookie sheets. Whisk together all dry ingredients in one bowl and set aside. Cream butter and sugar together in a large bowl, add vanilla, and egg one-by-one until butter and sugar lighten in color and becomes smooth. Add half of dry ingredients and blend well before introducing second half. Do not overheat, mix until just blended. Fold in chopped chocolate and chocolate chunks. 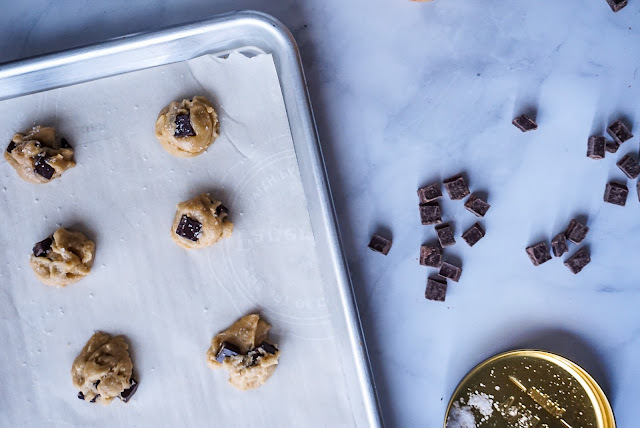 Remove cookie sheets and line with parchment paper. Drop tablespoon sized cookie dough onto sheets and sprinkle with sea salt. Bake for 12 minutes, turning the sheet after 6 minutes. Let cool for a few minutes and move to wire rack to cool completely.